I hope I don't jinx the next several episodes of Bones by saying this, but I think our show is back, TV Fanatics. While last week's Veteran's Day episode was heartfelt and moving, it was originally intended as a standalone, which left me wondering what would happen between then and the return of Pellant in January. "The Bod in the Pod" did not disappoint. Tonight, Bones and Booth were exactly where they're supposed to be: at the center of the show about Bones and Booth. All of tonight was fun, start to finish. We weren't overwhelmed with Sweets' lack of a love life. Finally. And while he is still living with Booth and Bones and doesn't seem to be able to respect their no-work-at-home boundaries, he fell back into his place as a secondary character. There was also balance among the rest of the team at the Jeffersonian. 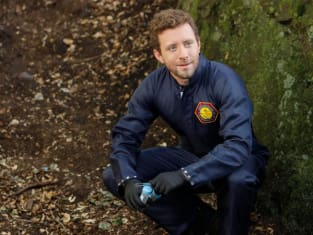 Hodgins seemed slightly less mad scientist, a trend I hope continues. I like him best when he's not spouting off about blowing things up. I also love that Hodgins and Angela always seem to be the first to know when there's another character entering into a new relationship, maybe because they are the original office romance at the Jeffersonian. It's like their instincts for sussing out new lovers are as strong as Bones' ability to find evidence that's seeped into concrete. None of them have to see the proof to know there's something more going on. Watching the two of them discover that Cam and Arastoo are an item, however unlikely, was kind of sweet. And it earned us scenes of Hodgins and Angela together outside of the lab which is always nice. Which brings me to Booth and Bones. One of the things that has always worked about Bones and Booth is their marriage of science and soul. Booth's heart balances Brennan's logic. What we've seen over the course of the series are all the ways in which Booth's outlook on life has changed Bones. While she's always cared deeply for those in her inner circle, she's become a better, kinder, warmer person for having him in her life. Tonight we watched as she let her instincts take over in their murder investigation. Her "gut" told her who the killer was and she knew instinctively that she was right, independent of any evidence to support her claim. I love the version of Bones who relies on her brain, but I also love the more intuitive side of Bones that emerges the longer she's with Booth. And speaking of love, that last scene between the two of them, where she listed reasons for loving him and he said he didn't need any, that was classic Booth and Bones. Classic. And perfect. So perfect, the entire conversation is on the Bones quotes page. Tonight reminded me of what I love about this show. I think Booth and Bones are back where they belong, TV Fanatics. And I'm excited. What did you think of "The Bod in the Pod?" Let's talk in the comments section below!